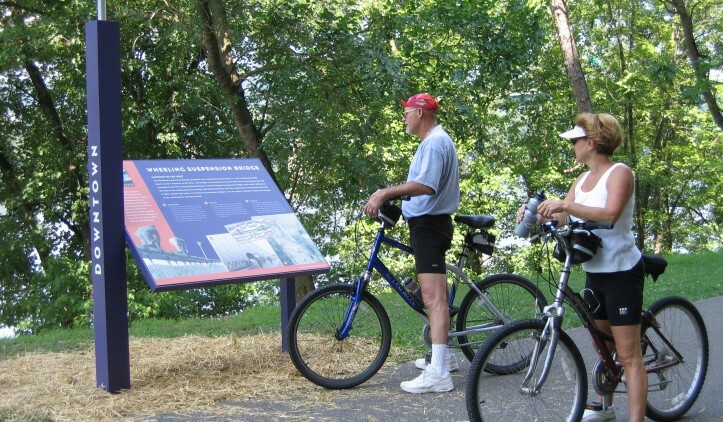 The Wheeling Heritage Trails running on the former B&O line are known locally as two trails that connect in downtown Wheeling: the Ohio River Trail and the Wheeling Creek Trail. The route is flat and paved, and beautiful signs along the way provide a self-guided tour of Wheeling’s past. The Ohio River Trail segment runs from 48th Street at Water Street in South Wheeling north to Pike Island Locks and Dam in Clearview. The trail provides an urban escape and an opportunity to soak up local history and modern industry in this historical city. The route follows the eastern bank of the Ohio River, once the lifeblood of the city’s manufacturing industry. Barges still go up and down the river, and with good timing and patience, you can watch one progress through the series of locks. Take a break to rest on a bench and you will be rewarded with a splendid view of the river and wildlife. This trail connects to the Wheeling Creek Trail at Heritage Port. From downtown Wheeling, the Wheeling Creek Trail heads east to Elm Grove. Along the way, you’ll cross high above Wheeling Creek on the Hempfield Viaduct and pass through Hempfield Tunnel, built in 1904. This segment of the Wheeling Heritage Trails is less urban and meanders along a wooded corridor. It is worth nothing that at the trail’s northern terminus, you can pick up the nearly 7-mile Brooke Pioneer Trail and continue your journey all the way to Wellsburg for a more substantial ride. To get to the starting point from downtown Wheeling, travel north on River Road and look for Pike Island Locks and Dam on the left. The parking lot is in front of the dam. The southern endpoint is located at the intersection of 48th Street and Water Street in downtown Wheeling.